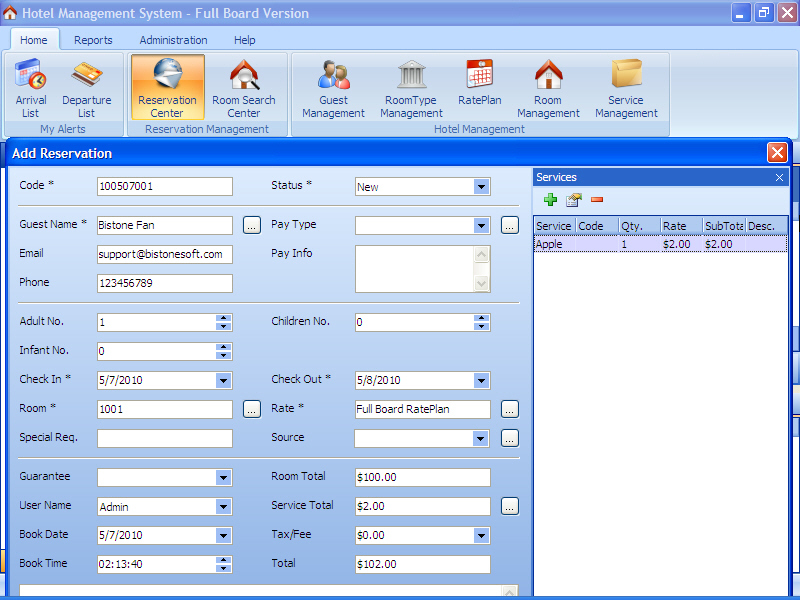 Hotel Management System is an easy-to-use hotel management software that can manage your full board hotel or motel. Ideal for reservations, hotels and guest houses. Affordable - no cost per booking charges.Easy To Use.Track Customers and avoid Double Bookings.Analyze Reservation Patterns.Automatic Calculations.Reporting System.Multi-users and rights managements.Support Full Board Package and Season Setup. ...... You can analyze reservation trends and work towards your future needs. Rearrange reservations and allocate rooms without an eraser in sight! Managing repeat customers and recording customer preferences helps you to retain your customers. Make your customers feel unique and special by recording personal notes. Welcome them with their nickname at the door! *Support Full Board Package and Season Setup. Qweas is providing links to Hotel Management - Full Board Version 3.11 as a courtesy, and makes no representations regarding Hotel Management - Full Board Version or any other applications or any information related thereto. Any questions, complaints or claims regarding this application Hotel Management - Full Board Version 3.11 must be directed to the appropriate software vendor. You may click the publisher link of Hotel Management - Full Board Version on the top of this page to get more details about the vendor.